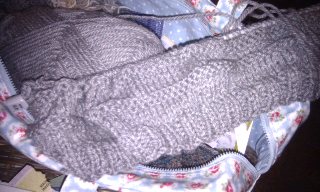 Decided to do another slouchy grey hat. Heavier yarn than specified in the pattern but approximately "simple squashy slouchy" first hat from Jane Brocket's Gentle Art of Knitting. Stocking stitch with a pleasing garter ridge. Have attached a photo. Decided rather than spending my Get Knitted Xmas voucher I'd look at my stash, list it where I can locate a yarn label for those I've got at least 50g of and see if I can find a suitable pattern on Ravelry. Will see how I get on. My DH is out with the bike club so more easily done on his iPad. Slight problem with lack of working printer at home. Need to collar one of my techie best mates when they come over for pasta and wine but never remember mid-conversation and wine! Have really been enjoying the Cast On podcasts! My new knitting guru lives in Pembrokeshire... close by! Really good to hear chatter about my favourite thing. Reminds me to get back to my local pub for their monthly Knitting Natter night! Finished my snood the day it snowed! Hat done & magazine purchase!